Debenhams' shareholders have overwhelmingly backed a £1.72bn ($2.9bn) takeover bid by Baroness Retail. The consortium, which includes buyout firm CVC Capital, raised its offer to 470p a share last month in a bid to see off rival private equity firm Permira. Despite protests from some small shareholders, 99.5% of proxy votes cast at the London meeting backed the deal. Chairman Peter Jarvis said: "I think it's a very good price... a very generous price, the best we could do." Debenhams had had a tough battle convincing shareholders that a take-over was the right way forward. One angry investor told the extraordinary general meeting: "If it's worth buying, it's worth keeping." Many voiced fears that the group was being sold off too cheaply, a year after former stablemate Arcadia was sold off to retail tycoon Philip Green. Profits at the Arcadia group - owner of the Top Shop chain - have almost doubled in the year since its sale, prompting criticism that the £850m price tage may have been too low. But Mr Jarvis said Debenhams was being sold "at a very full price". The firm's share price was just 256p before any takeover speculation emerged, he said, adding that since its 1998 demerger from the Burton Group Debenhams' shares had been trading at an average 30% discount compared to its peers. "The lack of interest from trade buyers indicates perhaps it is not being sold too cheap," Mr Jarvis said. Shareholders also expressed dismay over the news that Chief Executive Belinda Earl is set to pocket an estimated £4m when the deal is complete. She had faced criticism in the past for having helped rival bidder Pereira to put together its bid. However, her role at the firm is now unclear after Baroness emerged victorious from the bid battle. The bid was made through a scheme of arrangement which speeds up the normal takeover timetable. Now that the offer has been accepted, Debenhams will delist on 5 December and shareholders will receive their cheques 13 days later. Peacock Group chairman John Lovering - who led the Baroness bid - will replace Mr Jarvis as chairman of the group. 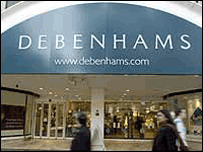 Debenhams has 102 stores in the UK and Republic of Ireland and 10 international franchise stores in Europe and the Middle East. Last month, it reported a 9.6% rise in full year profits to £168.4m. At around 1540GMT shares in the group were 0.75p lower at 467p.